Garnet Schist is a beautiful gray, silvery or brown colored metamorphic rock which shiny mica layers and an abundance of well-formed garnet crystals. Garnet schist is the same rock as a mica schist with the exception of the inclusion of the garnets (too cool!). The original rock type is typically a clayey rock with some calcite content such as a siltstone or a mudstone. The major minerals in a schist are quartz and mica. During the compression of the rock (metamorphism) the mica grains, which are thin and flat, are squeezed into sheet-like layers and give a silky, shiny appearance to the rock. 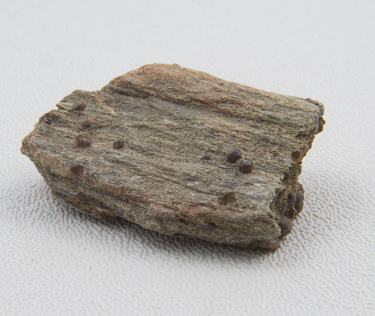 The texture of a schist is usually fine-grained; however, in a garnet schist the garnet crystals are large enough to be seen by the naked eye and appear to be “floating” in the schist rock. If schist rocks are broken, they will bread into wavy surfaces. Get your sample of Garnet Schist today! DON’T FORGET TO VOTE FOR US ON STARTUPNATION’S HOME-BASED 100 CONTEST! CLICK HERE TO VOTE AND LEAVE YOUR COMMENTS.